Sitting in the aftermath of the news that the 183c had already been superseded by the new 183c v2, I'm still impressed with the capabilities of my Hypercam. During recent months since I took delivery of the camera, I have written about my first steps of using it. I've covered areas such as setting it up, getting everything to talk correctly, experimental settings and initial findings of post processing. I've collected together a bit of experience with the camera now, and so decided it was time to bring together what I had learned so far and spend one night on one target. A couple of weeks ago, an unexpected evening of clear skies with minimal moon interference presented itself, so I set up out the garden ready to concentrate on one target for the evening. 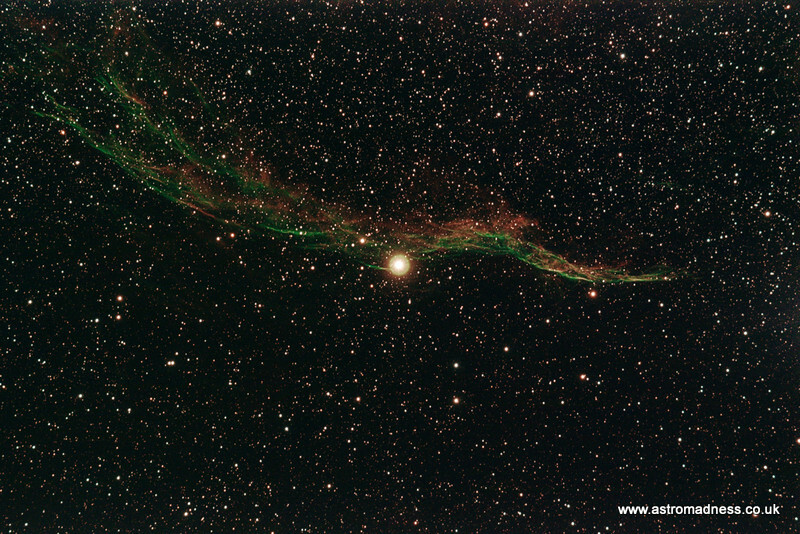 My chosen target was part of the Veil Nebula in Cygnus, NGC 6960, otherwise known as The Witches Broom. It's a target that I have photographed before with a DSLR, and was also amongst the initial batch of targets I pictured using the 183c, albeit in mono colour-space format. So far, with the 183c, I have only spent 60 minutes on any given target, and with reasonable results. All of the images this far have been taken with unguided 60 second light frames. 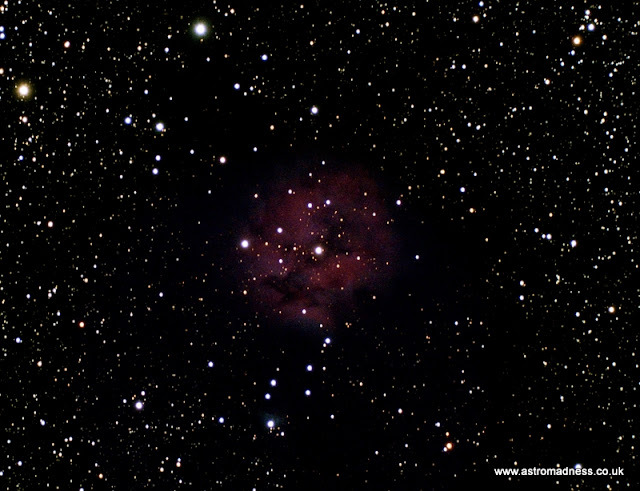 I decided to stay unguided, but this time collected 2 hours worth of light frame data in RAW 12. Initial inspection of some of the flat frames, I could see that I was getting a little trailing in stars, but for a majority everything was kept well in focus with no significant trailing. I decided that would suffice, and that the batch pre-processing script in PixInsight would deal with and omit any bad frames. What I ended up with was approximately 100 usable light frames. This was ago the first time I used a UV/IR filter with the camera, so at the same time, I was also omitting some light pollution from the data I was collecting. 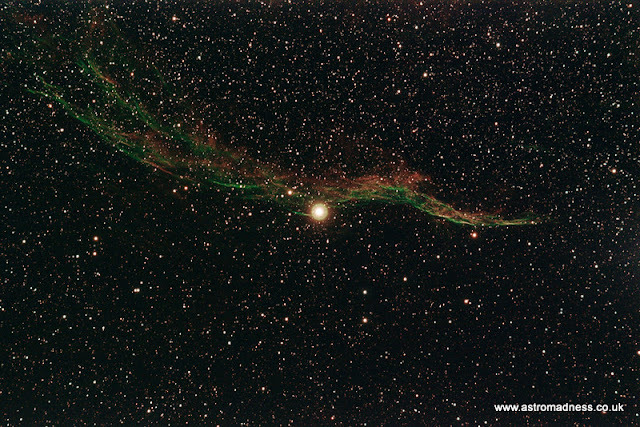 NGC 6960 The Witches Broom Nebula. Captured in Sharpcap with 60 second frames and 2000 gain. 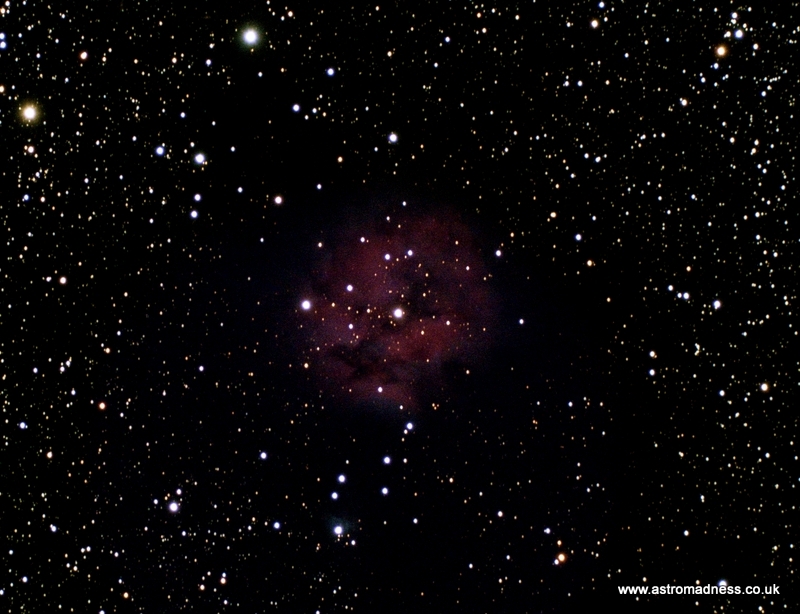 The colour has come out really well in processing, and the edges of the nebula are quite crisp. The extra data seems to have smoothed out the background more than in previous images. I hope that further light frames will make this better still. The one thing that lets this image down is the centre star. It looks somewhat bloated which happens during the initial histogram stretch. I expect that there is a tool somewhere to remove that effect, but I haven't been able to find it as yet! Things are definitely moving in the right direction with my imaging using the 183c. As a rough plan for the next session, I think I'll stick to a single target for the night again. I seem to be able to get constant results in terms of polar alignment with Sharpcap pro, so I will continue making sure I get that part of the process nailed at the beginning. As I've already mentioned, data is key, so I will go for 150 to 200 frames on the next target, providing it is not too bright. This should help the background smoothness even more. As a bit of a preamble to it, I'm going to get vncviewer or teamviewer working again so I will be able to monitor progress from comfort of the living room! I also want to re-introduce the focal reducer to the light train to be used in conjunction with the UV/IR filter and see if I start to get the halo effect again. We shall see! Thanks for reading, and clear skies. In my last post, I showed the results of my early attempts at DSO photography with my new Hypercam. I think it's fair to say that the images showed the potential of the camera, but results were somewhat spoilt by this halo phenomena that was appearing around the centre of the image, and in some cases, at several points around the image perimeter. That post sewed the seeds of a new plan of tests as a result of questions asked on a couple of forums and some emails to a few people. I needed to keep as much as possible the same in the whole process, changing only one thing at a time. One of the strongest suggestions was to look at omitting the Focal Reducer from the light train, so, with conditions looking favourable last Sunday, I set up all my equipment, got everything polar aligned and then fitted the camera without the FR. 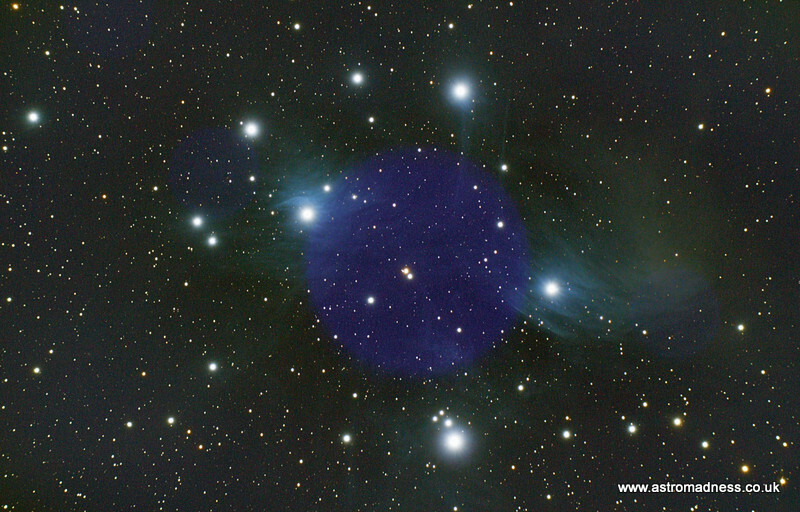 May targets for the evening needed to be the same as the previous attempt, so, C19, M45 and M27. Exposure, gain and all the other settings were kept the same. After taking a few test light frames, I took a copy of them and put them into pixinsight to stretch the image data. If the halo phenomena was going to be present, I would see it in this first stretch of the data. To my surprise, and relief, I saw no sign of the halo. I wanted to take advantage of the forecasted clear night, so I set about taking the first image run of the dumbbell nebula, after which I took the dark and bias frames too. Still with no sign of any anomalies, I moved onto the next targets and concentrated on collecting data. I stayed with the same settings as I wanted to prove that this first image run wasn't a fluke. After the first 3 image runs, I decided to take one last run on a new target, M76. There wasn't much more to the night to be honest. Data collecting and generally keeping an eye on things. I decided to take my flat frames the following afternoon, so I took the scope off the mount at the end of the evening, but left everything attached together. Over the coming days, whilst the clouds were preventing me from collecting any more photons, I started the prolonged task of beginning the process the data. It soon became apparent that the simple step of omitting the FR was yielding some good results. 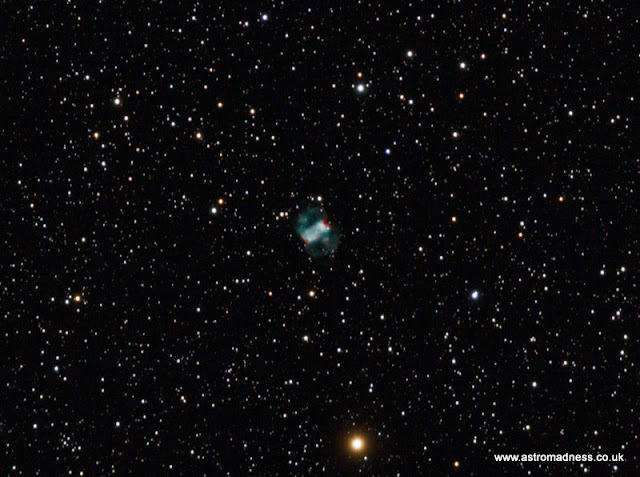 My first stacked and processed image was the dumbbell nebula, and I was pleased to see that there was no sign of the halo anomaly. I am really pleased with this image. The amount of colour and nebulousness that comes through from the 183c's sensor is so much more than I was ever getting with my DSLR. I posted this image on my Twitter feed, and the number of likes and re-tweets it has got has blown me away. I've never had so many for anything! 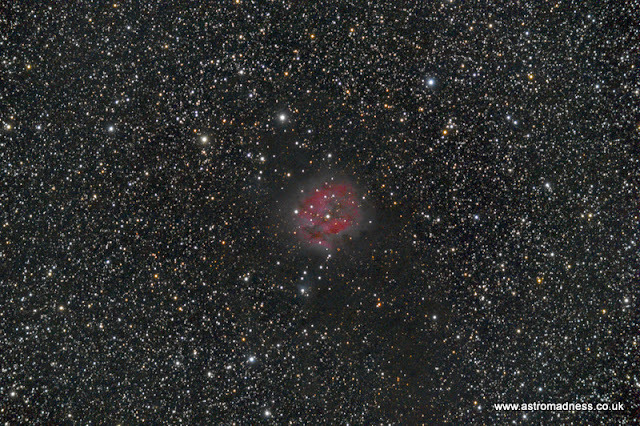 The next image that was processed was the final repeat from the previous session, C19. My previous attempt at this target actually produced quite a respectable image, considering that it was the first go at photographing it. However, it did still produce the halo effect which I managed to process out. For this attempt, again, I kept the parameters the same in terms of data collection. I went on and processed the new data stack and was pleased to see that again there was no sign of any halo anomaly. 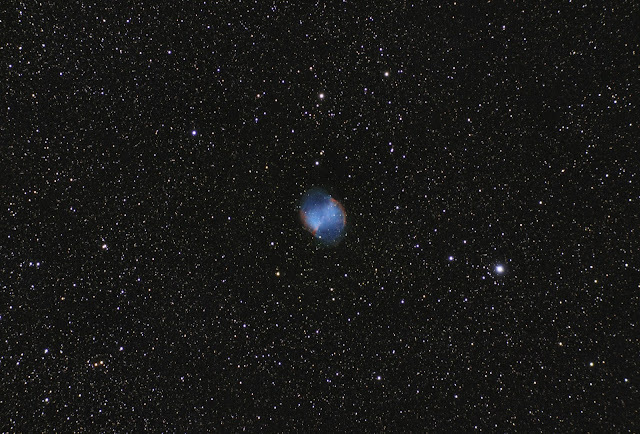 My last set of data collected that night, and the final set of data that I processed from this imaging run was for M76, A new target for not only the Hypercam, but for me also. After one hour of collecting data, and then applying all the calibration frames, I was left with this result. I'm quite pleased with this. Plenty of colour and definition, although there is still room for improvement! To get this frames correctly, I have cropped and enlarged the image slightly. It's made the focus appear a little out, but I was happy to sacrifice that if only to be able to see the nebula a little more clearly. A few weeks have gone by, and I've had the opportunity to get out with the Altair Hypercam 183c for a decent amount of time under a reasonable sky. I think I can now finally say that I have the process of setting up and data collection quite well refined. I have found that as long as I stick to the same principles and spend time on the polar alignment routines, I don't really need to engage guiding from PHD2. In my testing so far, I have been using 60 second exposures with very little, if any, signs of star trailing. This helps me keep to the principles of keeping this as simple as I can when it comes to equipment. In my last post, I gave some results and thoughts on the process of using SharpCap or AltairCapture as the method of choice for data collection. Since that post, I have been quite busy away from the telescope. 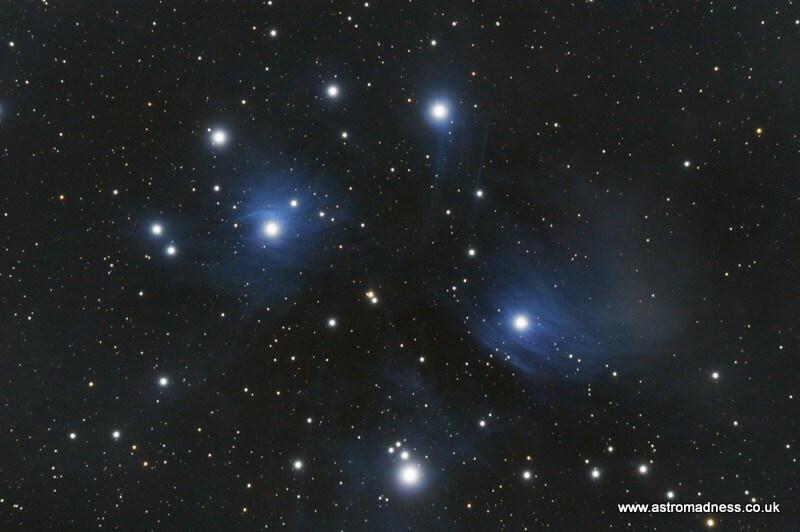 Firstly, I went to an Astrophotography Course where I was able to pick up some fantastic tips when it comes to use DSLR and single shot colour CMOS cameras like the 183c. But, perhaps the most interesting part of the course was regarding the post processing of the data. I was introduced to Pixinsight. An application designed specifically for astrophotography, it performs calibration, stacking, alignment and a whole host of post processing tasks. From the demonstration I watched, I was quite impressed, so since then, I have downloaded the free 45 day full trial of the software and have since got stuck into using it. To use SharpCap to connect to the Hypercam and collect the data. I now think SharpCap will give the better results, especially with all the new features coming on line with SharpCap Pro. To use a gain of 2000. To use an exposure time of 60 seconds per light frame. To collect approximately 30 bias frames. To collect 10 dark frames. To collect 10 flat frames. (More info on that to follow). So far, so good, but not all was plain sailing. 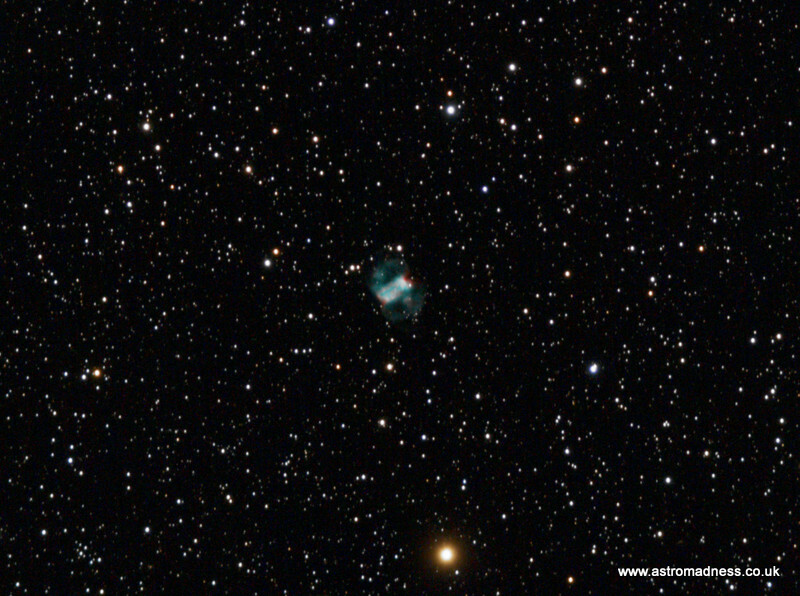 In fact, after collecting all that data, and then processing in pixinsight, it was soon apparent that I had a problem. Firstly, these are the 3 results. 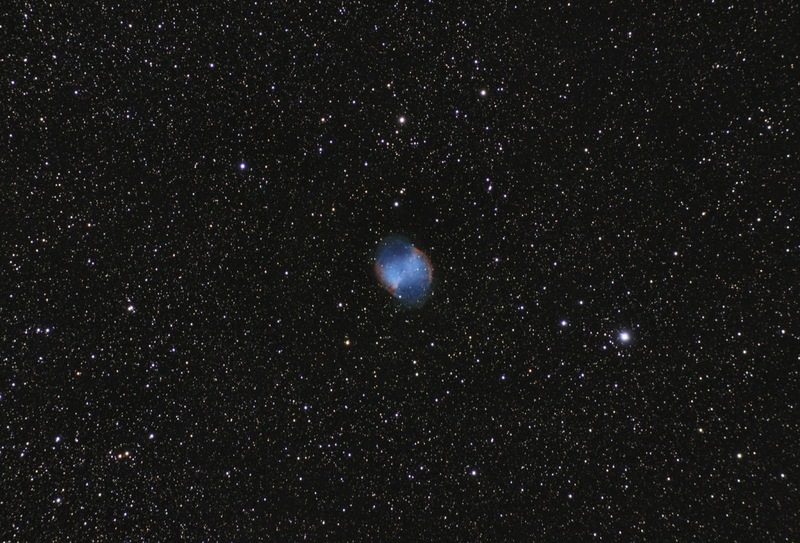 The results for M27 and M45, though show promise, are overall quite poor. Initially, C19 also had this halo effect, but I found that it was removed to an extent in processing. Looking at the light frames, and the flat frames, the feature was apparent in each of them to one extent or another. Of course, the act of stacking all these frames, though good for detail of the target itself, also amplifies this bright anomaly. This had me stumped. I couldn't figure out how this has happened, so I started to go through the process of what I had done. I kept drawing a blank, so I decided to open it up to a couple of forums on line and ask for advice. This is the beauty of astronomy. I've always found that there are always people out there willing to help. The suggestions were quick in coming and now I have a list of things to try out. Indications are that this could be down to one of two possibilities. Either there is excess light getting into the light train, or, a type of lens flare is happening. Excess light may have be caused from local light pollution, and though I don't think it was particularity worse than normal, I have to remember that the camera that I am now using is much more sensitive. A simple thing to try will be to extend the dew shield at the front of the telescope with a piece of card or similar and prevent any light coming into the OTA from the side. A second possibility was suggested, and that was it might be down to the x0.8 focal reducer that I used in the light train. It was suggested that perhaps the extra lenses in the reducer combined with the doublet in the telescope cause this effect at the point of focus. This is also an easy thing to test by simply using the same process of collecting data, but leaving out the focal reducer. This will change the field of view of the telescope, but results should be evident within the first few frames. I have also picked up another two tips from the forum and the course I attended. So far, I haven't used any filters in any of my imaging. It's been suggested that a standard light pollution filter is almost mandatory, and it stands to reason I suppose. Especially under the light polluted UK sky. The second suggested filter is a more specific Infrared/Ultra Violet filter. Both of which are now on the Christmas list! 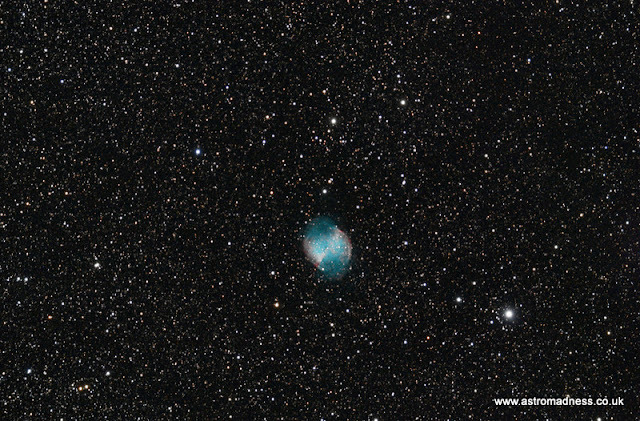 Amongst the various posts on the forums, someone kindly took my image of M27 and processed it further themselves. They managed to process out nearly all of the feature, although it was quite a technical procedure by the sound of it. Here is what the image looked like afterwards. 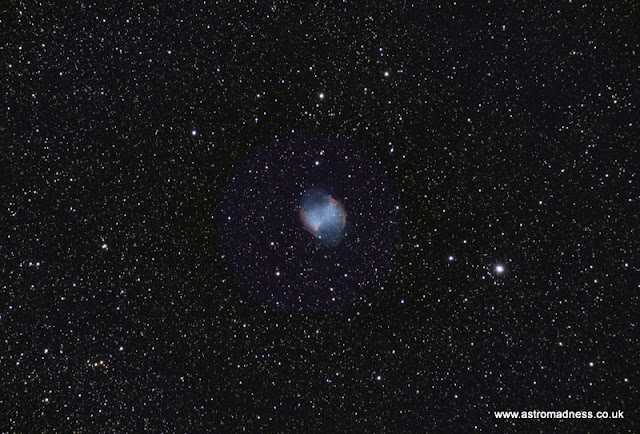 M27 processed further by a fellow forum member on the Stargazers Lounge forum, wimvb. So I know that my data does contain the information I want. I also know that it is possible to cut out a majority of the error, but I shouldn't need to carry out these additional steps. More testing to come! Finally, flats. Over the last couple of years, I have tried two main ways of collecting flats data. Both utilise a white t-shirt stretched over the end of the telescope. Previously I have used a white image on the laptop screen held over the end of the scope. Now though, I have bought a USB powered LED tracing box which is light weight and easier to hold up over the end of the scope. When I first saw the problems in the images above, one of the things I wanted to rule out was the quality of the flat frames I took within SharpCap. I was fortunate enough to be put in touch with the developer of SharpCap Pro who was able to provide me with the optimum mean values I should be looking for when creating my flat images. Fortunately, following the initial evening of data gathering, I had left the camera connected to the telescope at the same focus and orientation. 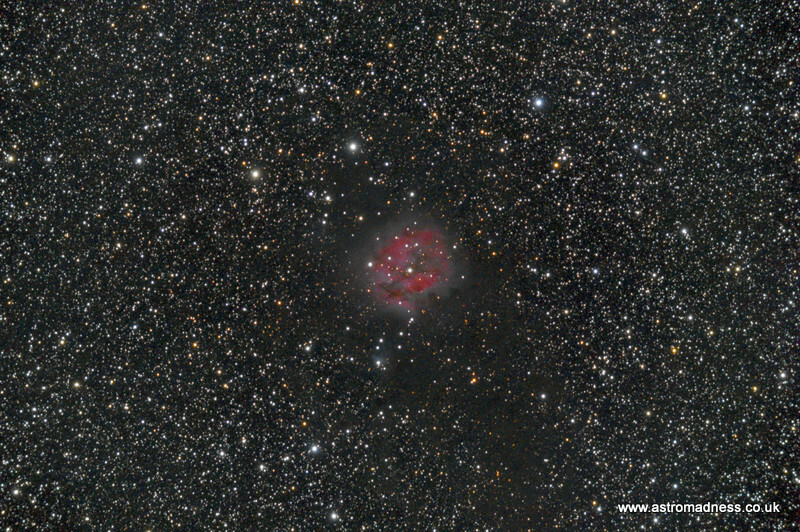 So, I was able to experiment and take further flats to introduce into the calibration process in pixinsight. I've now been able to rule out the flat calibration files. So, onward I go, and more trials are in the pipeline. The forecast is reasonable for Sunday evening, so it will be a good opportunity to try out the dew shield extension and omitting the focal reducer from the light train. Both will be able to provide fairly instant results as I should only need to take a couple of light frames. I should be able to do a full histogram stretch fairly quickly to see if the issue is still present or not. Keep an eye out for my results!